I’m a big fan of risotto. A naturally gluten-free meal that you can almost perpetually re-invent (within certain parameters, as outlined below!). When I’m trying to think of something vegetarian to cook, which we try to do at least twice a week, I generally fall back on a risotto. Wild mushroom is a particular favourite: a comforting, earthy and almost meaty dish, served with lashings of grated Parmesan and that oh-so-British addition of a green side salad (oh, heresy!). It’s an apparently simple dish which seems to have signed the death warrant of many a Masterchef hopeful, either because it’s been served with something that has no right to co-exist on the same plate (like a fillet of chicken – oh double heresy! ), or the contestant has over-stepped the boundaries of what is considered ‘cutting edge’ by adding strawberries and making it into a pudding (and thrice heresy!). We watch as Greg and John put down their forks and meet the gaze of the hapless cook with pained expressions… Over-cooking is what seems to do for most of them though. Which I can’t understand really because I’m not the most patient of cooks, when standing and stirring is involved, and I’m usually looking for some way or another to speed up the process or delegate it to another electrical appliance. I have done a fair amount of internet research to see whether stirring is strictly necessary and the answer seems to be ‘yes’ (at least as far as Italian chef Gino Locatelli and his mother are concerned, and that’s good enough for me). I know that cooking risotto in the oven is possible but something inside me seems to baulk at that. Polenta, yes, risotto, no. So I stand and stir. But as soon as I can get my tooth through it, it’s off the stove and into the bowls. 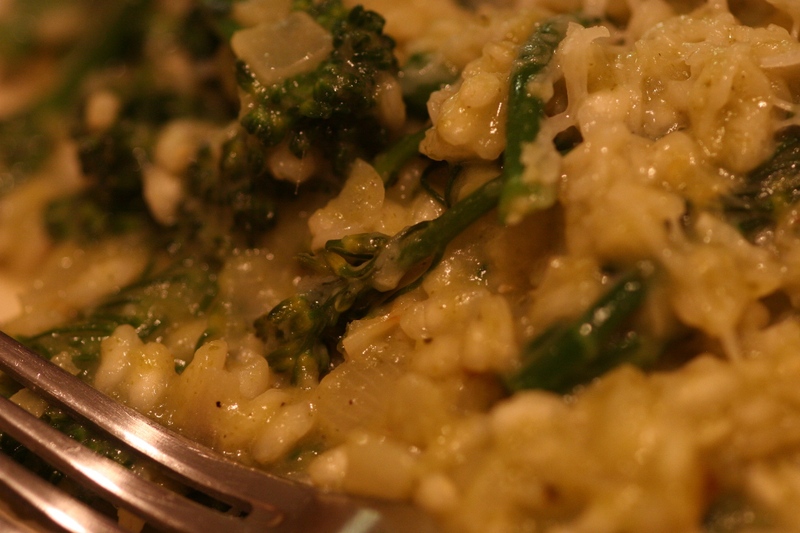 This take on risotto is inspired by a recipe for risotto con gli asparagi recorded by Claudia Roden in her book, The Food of Italy. I love asparagus risotto but asparagus isn’t in season right now so I thought I’d do my bit for the environment and try something else. 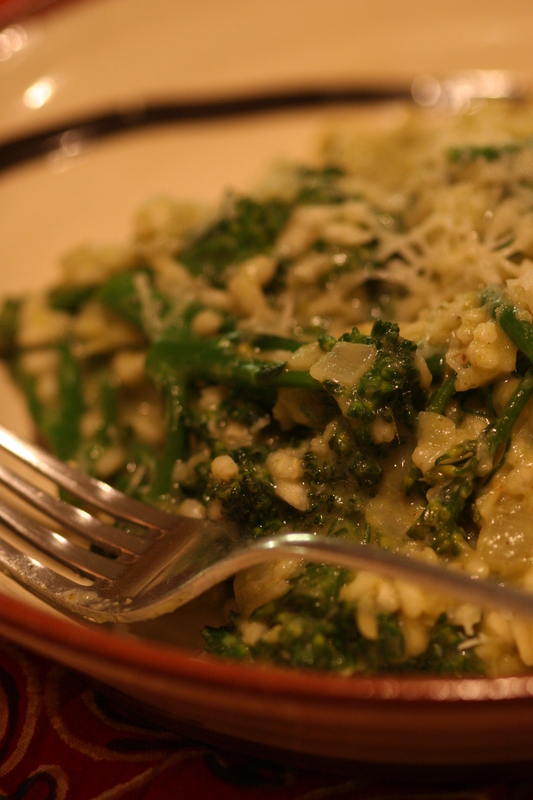 Like Tenderstem broccoli…which I have subsequently found out is also not to in season right now (ahem!). Tenderstem broccoli is a beautifully delicate and elegant vegetable which is, apparently, bred by crossing broccoli with Chinese kale. It has, as its name suggests, tender stems which can be eaten in their entirety and I always think of it in the same terms as asparagus. You would think that with the broccoli stems being cooked for so long that they would take on that rather metallic flavour that overcooked broccoli usually has (when it’s all mushy and khaki-coloured) but it absolutely doesn’t. Wash the Tenderstem broccoli. Cut off the florets (about 4-5cm from the tips) and set them aside. Chop the remaining stalks into 2cm lengths. Bring the vegetable stock up to the boil and add the stalks. Boil until they are very tender (about 8 minutes). Meanwhile place the florets in a steamer over boiling water and steam until only just tender. This should only take about 3 minutes and the florets should be bright green. Refresh them in cold water to prevent them from continuing to cook and set aside. When the stalks are done, blend them with a hand blender along with the stock in the saucepan. * Return to the heat and bring back up to a bare simmer. Heat the olive oil in a large frying pan (skillet) over a low to medium flame and add the chopped onions. Fry for several minutes until softened, pale and translucent. Add the minced garlic and continue to fry gently for another couple of minutes. Add the rice and stir to thoroughly coat the grains with oil. Pour in the wine and bring to the boil. Simmer gently, stirring all the while. When the wine has been absorbed by the rice, add the stock containing the creamed broccoli stalks a ladleful at a time, stirring until it has all been absorbed before adding the next. After adding the final ladleful, stir in the grated cheese and gently fold in the steamed broccoli florets. Stir gently until the stock has been absorbed and you are left with creamy and al dente rice. Serve immediately, sprinkled with more Grana Padano or Parmesan. *Blending hot liquids in a goblet blender can be quite dangerous. If you’re going to do this, I would suggest that you wait until the stock and stems have cooled before blending. I love quiche. 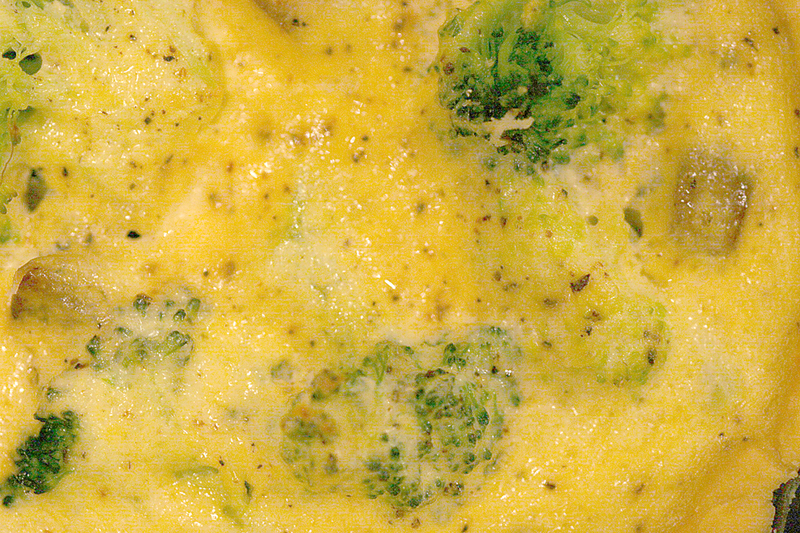 In my pre-glutenfreebie days, a supermarket quiche would often find its way into the trolley for a quick, mid-week meal. Pop it in the oven and put some potatoes on to boil. Salad in a bag or baked beans from the tin. There are unhealthier comfort foods than this. But not anymore. I’ve got to really want quiche now because I have to make it from scratch and it isn’t a ten minute job. I must admit that I rarely ever made pastry before either – it was much easier to buy it ready-made (and even ready-rolled!) from the chiller cabinet. Now I really enjoy making pastry and thinking of what I can add to it to make it more interesting. I really like the Parmesan in this one – it makes the pastry really savoury. I once heard Sophie Grigson say that a quiche is only worth making and eating if you go the whole hog with adding double cream to the eggs, but I don’t happen to agree with her (I’m sure she must be gutted by this revelation! ).But I don’t believe in clogging up your arteries just for the sake of it. I try to use low-fat ingredients and buy low-fat foods when I think it really doesn’t matter but if the low-fat alternative is truly unpleasant (such as low-calorie coleslaw – bleugh! ),then I give it a wide berth. I use half-fat crème fraîche in quiche and, while it might not be as unctuous as the mega-calorie version, I still think it tastes delicious. You will also need 4 13cm x 3cm loose-bottomed fluted tartlet tins. Make the pastry. Pulse the flour, ground tapioca and grated cheese in a food processor to combine and get rid of any lumps. Add the cubes of butter and shortening and pulse once more until the mixture resembles fine breadcrumbs. Add the egg and continue to mix until the mixture resembles damp sand. The amount of water you’ll need to add will depend upon the absorption of your flour mix and the size of the egg, so add about a tablespoon of the water first and continue to pulse, adding more water if required. The mixture needs to come together as a slightly sticky dough. Tip the pastry out onto a lightly floured surface and bring together as a ball with your hands. Slightly flatten and cut into four portions. Form each portion into a ball and flatten into a disc about 5mm thick. I tend to do this with the heel of my hand, perhaps finishing it off with the rolling pin. Carefully lift the disc into the tartlet tin and press it in firmly. Remove the surplus pastry from around the rim, either with a knife or your thumb. Mend any tears in the base with surplus pastry and then prick it with a fork. There should be some pastry left over. Reserve this in case any cracks need mending after blind baking. Line the cases with baking parchment** and baking beans. Place them on a baking sheet and bake them blind in the oven for 15 minutes. Remove the beans and parchment, return to the oven and cook until the pastry is golden (about another 5-10 minutes). Remove from the oven and mend any cracks with leftover raw pastry. Lower the oven temperature to 150°C (300°F). While the pastry is baking, gently fry the mushroom cubes in a knob of butter (or substitute: I used olive spread). Add the garlic after the mushrooms have been cooking for several minutes, so that it doesn’t burn and also a sprinkling of salt (this should help to release the liquid from the mushrooms). Cook the mushrooms until they are a dark, golden brown and most of the liquid has evaporated (this should take about 10 minutes). Set aside to cool. Blanch the broccoli florets in a large pan of boiling water for 3 minutes. Drain and refresh in cold water. Set aside. Lightly whisk the eggs and crème fraîche together in a jug. Season with salt and pepper (but remember that some salt has already been added to the mushrooms). 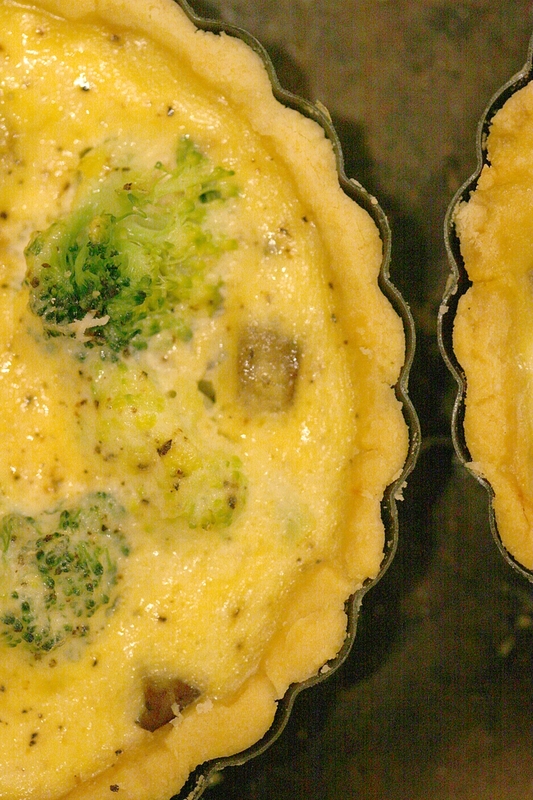 When the tartlet cases are out of the oven, scatter the mushrooms evenly over the base and then divide the broccoli florets equally amongst them. Carefully pour the egg mixture into the four cases and cover loosely with aluminium foil. Return them to the oven and bake for 15 minutes. Carefully remove the foil and return to the oven for a further 10 minutes or until the outside is set but the middle is still wobbly. Allow to cool slightly so that the egg custard continues to set. Serve warm with new potatoes and a salad. * I’m using up some tapioca that I ground myself in a coffee grinder because I couldn’t find any tapioca flour. I think tapioca flour is probably a bit finer. ** I use Heston Blumenthal’s trick which is to scrunch the parchment up several times and smooth it out before putting it in the tins.